No we didn't make pie and coffee - but, as it was only Lena and I, we worked until about 10 and then went out for reinforcement. Pumpkin pie season appears to be over, but the coconut cream was just fine. Actually neither of us made Valentines because we got off on another tangent: discussing the selling of raw materials and supplies on Etsy. There is at least as much of that being done as the selling of hand-crafted items, and as I have decided to retire a lot of fabric I may give it a whirl. I'll probably put some big ziplocs of assorted scraps and short lengths out for sale at the studio, too. So if you're needing fabric (and not too much of any one kind) you may want to come to the next Third Friday or drop by some other time. It would be good to call first. So I thought I'd say so. Typically no one shows up at Art Parties that early, but tonight would be the night, wouldn't it? I probably won't be ready for guests until about 6. But if I'm there I'll let you in. You won't freeze. It's that time again. Rummage through the gathered red, pink, black (red & black! ), lacy, mushy, hearty, wry and anatomical odds and ends to concoct loving (or not) greetings for your loved (or liked) ones. valentines are also your last best chance to send greetings to the people you forgot at Christmas card time. There will be paper, lace (paper and otherwise) blank cards and envelopes, all the standard colorizing and mark-making supplies, glue, scissors, magazines to cut up, a bit of clip art, and embellishments. I'm also pulling out and photocopying all the heart images I can find - we're talking anatomical illustrations - and I have some good ones. Maybe I'll throw in some other organs, too. After all, what's a heart without a brain, or a stomach, or a spleen? I'll have postage stamps to buy at cost, and there is a mailbox out front of the building, though it might be a bit early to put them in the mail. But, carpe diem, you know. SOMETHING DIFFERENT for 2009. I've decide to put out a piggybank (well, it's really a dog) and ask that attendees drop in a dollar on the evenings they come to play. It's an informal thing, and I'm doing it mostly because people have expressed discomfort at not pitching in, to which I can only say that you are a nice bunch! But, yes, there are things that we will eventually run out of, like glue, that can't be scrounged but have to be purchased. Please don't think you have to stop by the ATM on your way just because you don't have four quarters in your pocket; that would make me feel real bad! And don't feel that you'll make me twice as grateful by putting in two dollars; I'll just be embarrassed. OK? Oooooh, squishy paper! 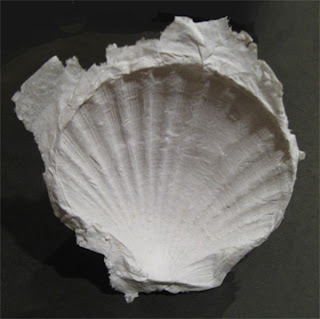 Here's one sample of some paper castings I've been working on, this one done in a scallop shell with bits of a paper napkin. It's easy and pretty fast, and it's what's cooking tomorrow in Room 206, on the first First Tuesday of the New Year. I'll have everything you need to do some experimentation: molds, paper, and a toaster oven to expedite the drying. Water and paintbrushes, too. That's all you need. You just layer pieces of thin, soft paper on your mold using lots of water (that's what makes it settle in to the crevices), then let it dry and pop it off. I think a garland of these shells would be gorgeous! As usual, come any time after 5pm and stay as late as you want. BUT if no one is there by 8pm, I reserve the right to close up shop and go home. But I probably won't, because I have shell garlands to make! See you. I hope your year has begun well. Mine has begun with, among other things, a new blog. I'm going to separate my own art work from the activity in Room 206. This blog will continue to be about the bi-monthly Art Parties and whatever other events are going on in the studio. Visit the new blog, More Art Please, to see what I'm doing every day in 2009. Yep, I accepted the challenge to make a work-of-art-a-day for the year. See you over there.